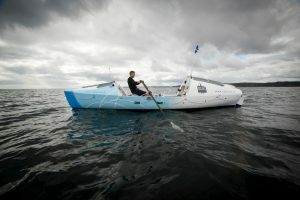 As you may have seen in the news recently, brave adventurer Niall Iain Macdonald is a week into his solo rowing challenge from Norfolk, Virginia to Stornoway. What you might not know about Niall Iain, is that he is our very own Catherine’s cousin. He is completing this challenge in aid of the Scottish Association for Mental Health (SAMH), who support over 3,000 people with mental health issues daily. Over the coming weeks, he will be covering a distance of over 3,400 miles in his boat ALBA. Only 13 people have previously successfully rowed solo from west to east across the North Atlantic. Originally due to leave from New York, Niall Iain relocated to Norfolk Virginia due to adverse weather conditions. His first 130 miles of the challenge has been plagued with strong winds. He will be rowing for 12 hours a day and expects to take around 3 months to reach Stornoway. He is hoping to raise not only awareness of mental health, but also at least £100,000 for SAMH. The broadcaster based in Stornoway has been very open about his own mental health challenges, and how they have inspired him to challenge himself. He has raised more than £20,000 so far. You can keep track of his progress on his website as well as in the local and national media. Good luck Niall Iain! To find out more about NY2SY visit https://www.ny2sy.co.uk/ or to make a donation visit https://www.justgiving.com/fundraising/ny2sy.